IMMEDIATE RELEASE (DATE TBD, 2015) – LOS ANGELES, CA. Forever 21, one of the world’s leading fashion retailers, announces the launch of their global Holiday 2015 collection on Monday, November 2. For the season that is synonymous with giving back and spending quality time with family, Forever 21 partners with the charity Soles4Souls by donating one article of clothing for every outerwear purchase made during the holiday season (December 1 – December 24) up to 1.5 million dollars. Photographed by elite fashion photographer Dan Jackson and styled by industry legend George Cortina, Forever 21 highlights three authentic families that each represent what it means to be part of a global modern family. 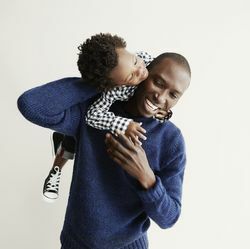 The images radiate the contagious energy associated with the holidays, including adorable two-year old U.S. based model Lukas Cabral with his mother Krystle Wilson, father Armando Cabral, and uncle Fernando Cabral. Also featured are South Korean husband and wife duo Dae Na and Bo Ra Nam, and English identical twin sisters May and Ruth Bell.